The Airbus A330 is a large-capacity, wide-body, twin-engine, medium-to-long-range commercial passenger airliner. It was developed at the same time as the four-engined Airbus A340, and will likely be replaced by the Airbus A350. Airbus intended the A330 to compete directly in the ETOPS (Extended-range Twin-engine Operation Performance Standards) market, specifically with the Boeing 767. The A330 first entered service in 1987; airlines purchased it to replace the McDonnell Douglas DC-10. 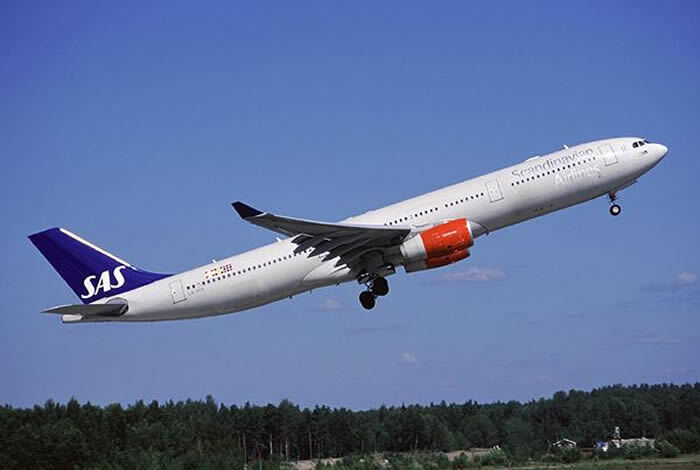 The A330 is 38% more fuel efficient than the DC-10. The A330's fuselage and wings are virtually identical to those of the smaller A340 variants, although it has different engines. The A330 basic fuselage design is inherited from the Airbus A300, and the nose/cockpit section and the fly-by-wire system and flightdeck are inherited from the A320. Both the A330 and A340 are assembled on the same final assembly line at Toulouse-Blagnac, France. 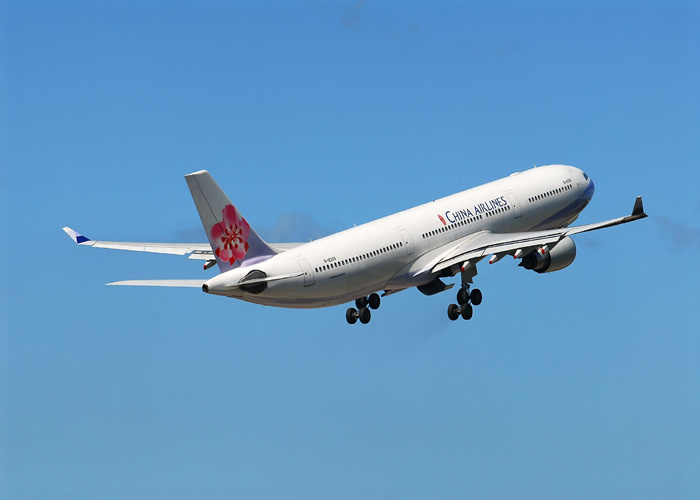 By the end of March 2008, a total of 921 A330s had been ordered and 533 delivered. There are two main variants of the A330. The A330-300 was launched in 1987 with introduction into service in 1993. The A330-200 was launched in 1995, introduced in 1998 with passenger, freighter and tanker (Airbus A330 MRTT) variants available. EVA Air's A330-203 Hello Kitty jet (B-16303)The A330-200 was developed to compete with the Boeing 767-300ER. The A330-200 is similar to the A340-200 or a shortened version of the A330-300. With poor sales of the A340-200 (of which only 28 were built), Airbus decided to use the fuselage of the A340-200 with the wings and engines of the A330-300. This significantly improved the economics of the plane and made the model more popular than the four-engined variant. Its vertical fin is taller than that of the A330-300 to restore its effectiveness due to the shorter moment arm of the shorter fuselage. 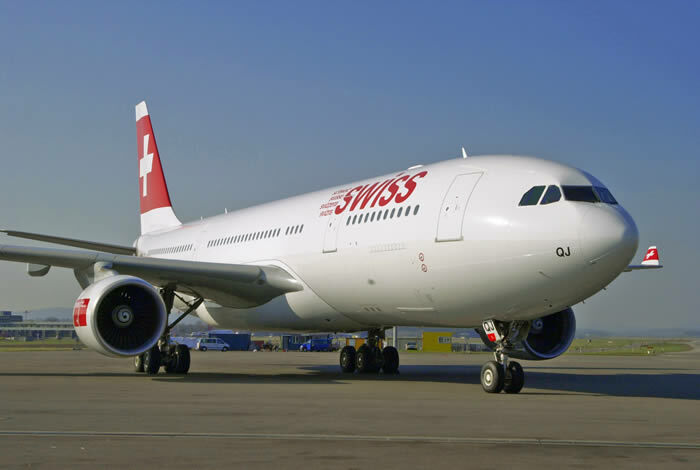 It has additional fuel capacity and, like the A330-300, has a Maximum Take-Off Weight (MTOW) of 233 tonnes. Typical range with 253 passengers in a three-class configuration is 12,500 km (6,750 nautical miles). Power is provided by two General Electric CF6-80E, Pratt & Whitney PW4000 or Rolls-Royce Trent 700 engines. All engines are ETOPS-180 min rated. First customer deliveries, to ILFC/Canada 3000, were in April 1998. The direct Boeing equivalent is currently the 767-300ER and in the future will be the 787-8. 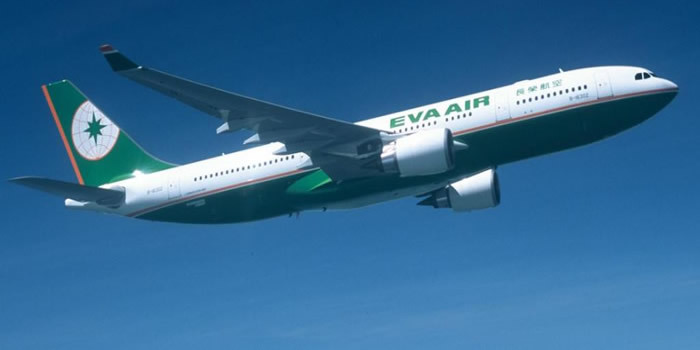 The A330-200 has sold strongly since its launch, outselling the Boeing 767-300ER by 23 to 9 in 2004. Due to flagging A300-600F and A310F sales, Airbus first began marketing a freighter derivative of the A330-200 around 2000-2001, although it was not launched at this time. The A330-200F re-emerged at the 2006 Farnborough Air Show and received its industrial go-ahead in January 2007. Entry into service is planned for the second half of 2009. Artist's concept of the A330-200F derivative.The A330-200F is a mid-size, long-haul all-cargo aircraft capable of carrying 64 tonnes over 4,000 NM / 7,400 km, or 69 tonnes up to 3,200 NM / 5,930 km. It introduces a new versatile main-deck cargo loading system that will be able to accommodate both pallets and containers. Several different arrangements will be possible on the main deck, taking up to 23 Side-by-Side (SBS) pallets, aimed at the high volume, high value commodities or Single Row (SR) loading of 16 pallets (96”x 96”x 125” SR pallets) and/or nine AMA containers aimed at the general cargo higher density markets. To overcome the standard A330's nose-down body angle on the ground, the A330F will make use of a revised nose landing gear layout. The same leg will be used, however it will be attached lower in the fuselage, requiring a distinctive blister fairing on the nose to accommodate the retracted nose-gear. Power is provided by two Pratt & Whitney PW4000 or Rolls-Royce Trent 700 engines. Airbus has 66 firm orders from seven customers: Aircastle 15, Avion Aircraft Trading 8, Etihad Airways 3, Flyington Freighters 12, Guggenheim Aviation Partners 6, Intrepid Aviation Group 20 and MNG Airlines 2. Additionally ACT Airlines has signed an MOU for 2. Deliveries will begin in late 2009. Other wide-body freighters include the B767-300F, DC-10F, MD-11F, B777F. 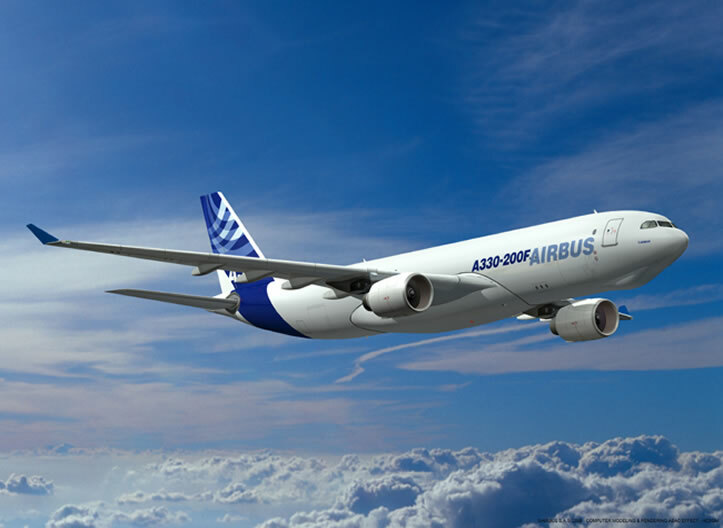 Airbus will assemble the A330-200F in the USA along with the USAF KC-45A at its new assembly line in Mobile, Alabama. US Airways A330-300 taking off from London. Qantas Airbus A330-300 in Singapore.The A330-300, which entered service in 1993, was developed as replacement for the A300. It is based on a stretched A300-600 fuselage but with new wings, stabilisers and fly-by-wire systems. The A330-300 carries 295 passengers in a three-class cabin layout (335 in 2 class and 440 in single class layout) over a range of 10,500 km (5,650 nautical miles). It has a large cargo capacity, comparable to early Boeing 747s. Some airlines run overnight cargo-only flights after daytime passenger services. It is powered by two General Electric CF6-80E, Pratt & Whitney PW4000 or Rolls-Royce Trent 700 engines, all of which are ETOPS-180 min rated. 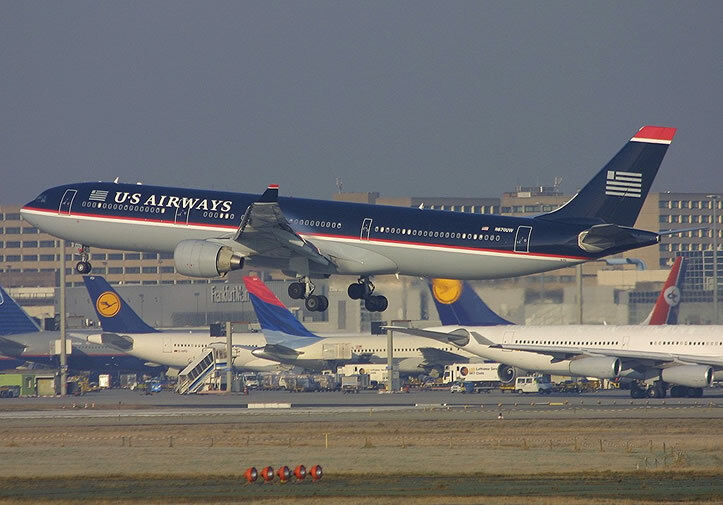 US Airways was the launch customer in the United States with nine A330-300s. The direct Boeing equivalents are the Boeing 777-200 and the Boeing 767-400ER. The Multi-Role Transport and Tanker version (MRTT) of the A330-200 provides aerial refueling and strategic transport. To date it has been selected by Australia, Saudi Arabia, the UAE, and the UK. On February 29, 2008 the United States Air Force announced that an American assembled variant of the A330 MRTT, now designated KC-45A by the USAF, had been selected to replace the Boeing KC-135 Stratotanker. The Air Force's fleet of KC-135 tankers has been in service since 1957, the last aircraft having been delivered in 1965.